Bismarck Donuts are called "Berliner" or "Krapfen" in German and they have lots of different fillings. The most popular filling in Germany is the classical marmalade and in Italy for example we use to fill them with custard. Whisk in a cup the yeast with a teaspoon of sugar and a bit of warm milk and let it stand for 5 minutes. Meanwhile heat the butter with the residual milk, until butter melts. In a large bowl put the flour, the salt, the sugar and the egg together. Make a well in the middle of the flour and pour the yeast mixture and the milk with the melted butter inside. Begin to knead with your hands for minimum 10 minutes, until smooth and elastic. Cover the bowl with a kitchen towel and let the dough in warm draft-free area until doubled in volume, about 1,5 hours. On a floured surface, roll out the dough (with a thickness of 2cm) and cut out circles with a cup or a bugger cookie cutter. But the discs on well-floured parchment leaving some space between each other. Cover the Bismarck Donuts with a kitchen towel and let them rise in warm, draft-free area until doubles in volume (for about 45minutes). Heat enough vegetable oil (more or less 500ml) in a small cooking pot. Place the dough in the pot and cook with the lid on, until golden (for about 2 minutes). Flip over and continue cooking until golden on the other side. Place on a paper towel lined cooling sheet to drain. Repeat this step with all the dough and let them cool completely before filling. Take a pastry bag and put the desired filling inside. 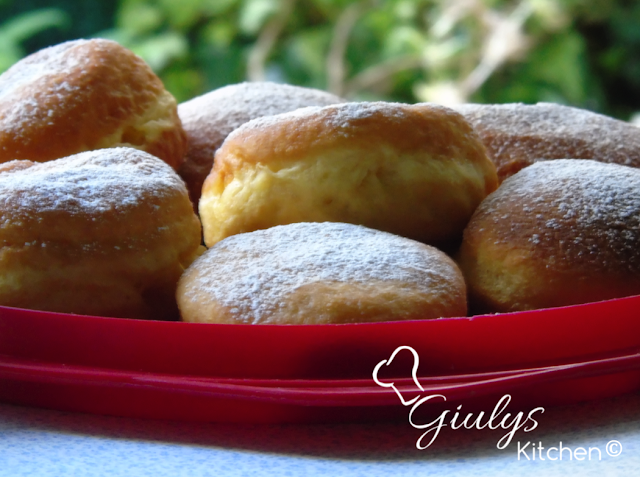 Fill the Bismarck Donuts and sprinkle them with icing sugar.